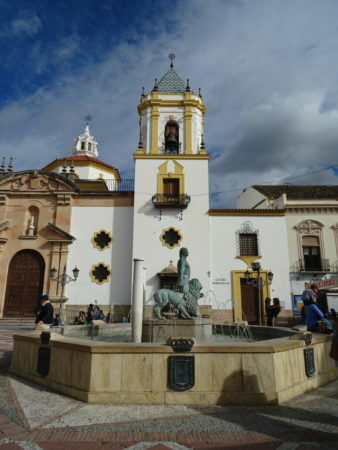 I have already written posts about Málaga and Nerja, that’s why today I would like to tell you more about two beautiful villages that you can’t miss in Andalusia – Ronda and Júzcar. Ronda is located about 100km west of the city of Málaga and is one of the oldest towns in Spain. It stands at an altitude of 739 metres and is one of the most visited places in Andalusia. 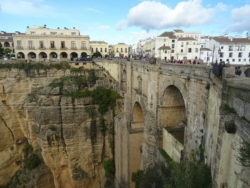 Even though in the region there are some remains from Roman period, Ronda’s cultural heritage comes mostly from the era of its Moorish occupation. In Ronda, there are three bridges. Puente Viejo (Old Bridge) is the oldest one built in 1616. On the photo, you can see Puente Viejo and if you look well there can be also seen Puente Romano (Roman Bridge) under it. When you pass the Old Bridge, you’ll get to the Archway of Philip V. If you follow the way, it will lead you to other attractions of the town. I would say that Puente Nuevo (New Bridge) is kind of a symbol of Ronda. Whenever you look for photos of Ronda, you’ll find photos with this bridge. It’s the newest and largest of the three bridges. It’s height is 98 metres. The construction started in 1759 and took 34 years to build. There is a chamber above the central arch that was used for a variety of purposes, including as a prison. It’s possible to enter the chamber, inside of it there is an exhibition of the history and the construction of the bridge. The admission is around 3€. We didn’t go there so, unfortunately, I can’t tell you more about it. We found this place by a coincidence as we were walking from the Old Bridge, passing the Arch and a sign about the palace appeared in front of us. We weren’t sure if it’s worth visiting as the admission was 5€ for adults. At the end we were persuaded by the ticket seller and I have to say that we didn’t regret it! Even though you actually don’t get into the palace, it was worth visiting. The palace was never the home of Moorish king. It was built in the 18th century, when Moorish Spain was already a distant memory. 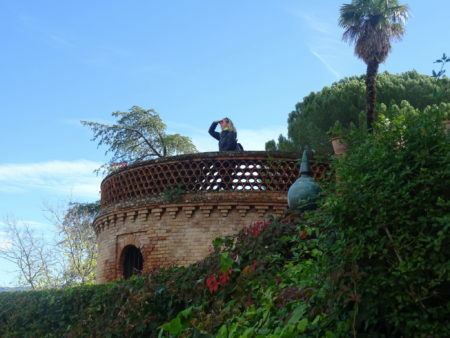 Its apparently Moorish gardens are even more recent, having been designed by the French landscape gardener Jean Claude Forestier in 1912. 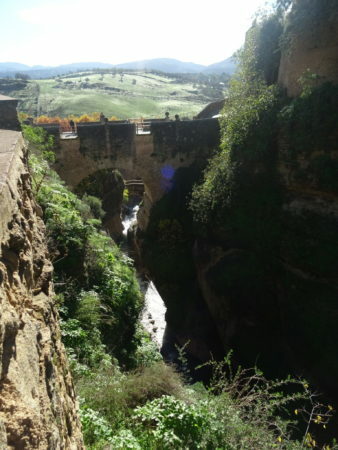 The palace shelters one genuine and important relic of Ronda’s Moorish era – the so-called Water Mine, a set of steps down to the river carved into the cliff wall. The Garden of Forestier is not so large but it’s nice. Nevertheless, the best part of the visit is definitely the Water Mine. Going down a million stairs with the water dripping on your head was difficult but not as difficult as the way back. Going up a million stairs was the real challenge, not mentioning the water drops falling exactly on the middle of your head. We got upstairs quite exhausted but we were happy we made it! 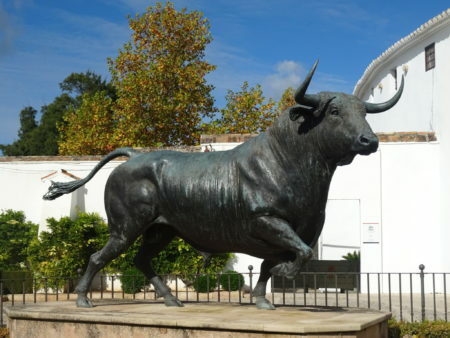 Ronda is said to be the birthplace of modern bullfighting. The Real Maestranza is one of the oldest and most picturesque bullrings in Spain. It was built in 1785 by the architect Jose Martin Aldehuela – the same architect that built the New Bridge. The ring can hold up to 5000 spectators. 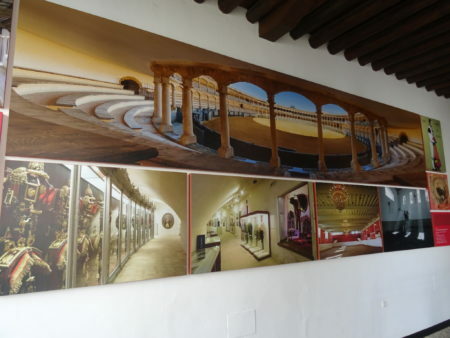 Nowadays there is a museum and guided audio tours around the bullfighting ring. On the square “Plaza de los Toros”, there is a sculpture of a bull as well as some more sculptures of different bullfighters. We didn’t enter the bullring because the admission of 7€ per adult seemed quite high to us, as we weren’t that much interested in seeing it. 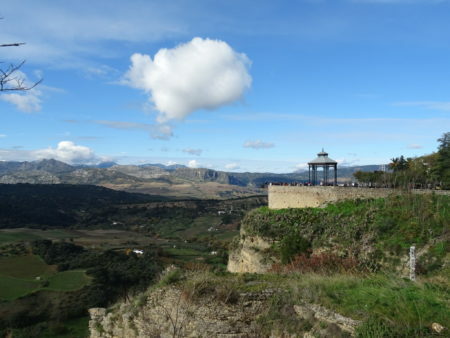 In Ronda, there are two viewpoints that you shouldn’t miss – Mirador de Aldehuela and Balcón del Coño. Both of them are located near the New Bridge. I would especially mention the second one. From the New Bridge you walk along the “Paseo de E.Hemingway” which leads you to the Alameda Park – a delightful park created in 1806. 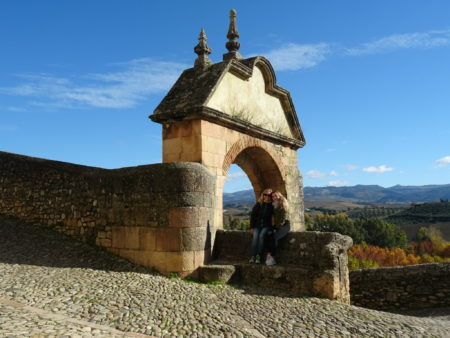 Just nearby there is a famous viewpoint Balcón del Coño where you get the most impressive view of the valley. Plaza del Socorro is the modern political centre of Ronda. There is a parish church that was built in 1956. I mention this square especially because there are many restaurants where you can have a lunch. If you want a change from the Spanish food, I would definitely recommend the Italian restaurant that we discovered. 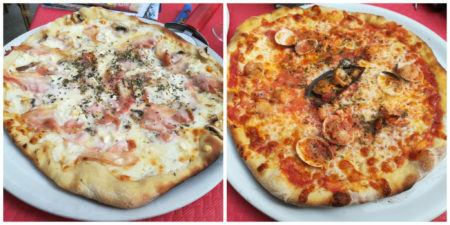 It’s called “Restaurante Pizzería Michelangelo” and it has very tasty pizzas as we could try. The restaurant has many great references and the prices are quite low (comparing to other restaurants). Another place you can visit in Ronda are the Cuenca Gardens. It’s just near the Old Bridge. The gardens were built in 1975 for the twinning of Ronda and the city of Cuenca. The Cuenca Gardens are spread out over 23 horizontal terraces connected by many flights of steps. I suppose that the best time to visit it will be in spring when everything is blooming! At the end I would like to mention some more places that you can see. We haven’t visited them though. 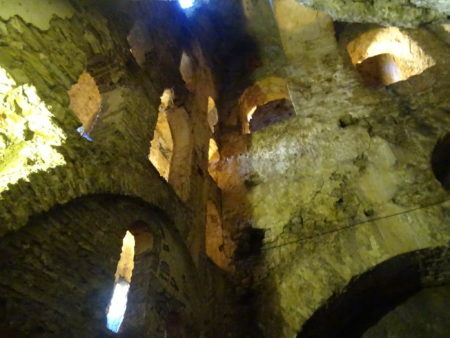 These baths are the best preserved Arabic Baths in Spain. They were built at the end of 13th century. They are located near the Roman Bridge. The Mondragon Palace is a home to the municipal museum and gardens. It was originally built in 1314 by the Moorish king Abomelik and it was later used as a primary residence of the queen Isabella and king Ferdinand. This place is not situated directly in Ronda, it’s around 20km far from the town. There are ruins of the old Roman settlement there. A large theatre dating from the 1st century AD and several houses are clearly distinguishable. The name “Acinipo” means “city of wine” and was one of the few cities in Roman Empire that made wine that was exported back to Rome. 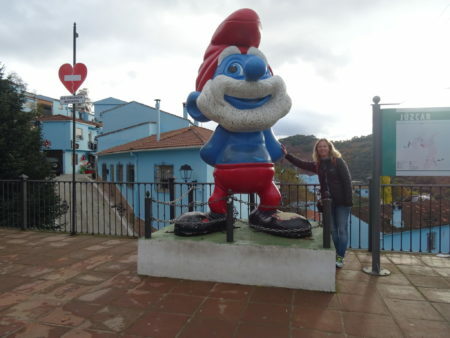 The second place we visited on Saturday was Júzcar, the village of the Smurfs. 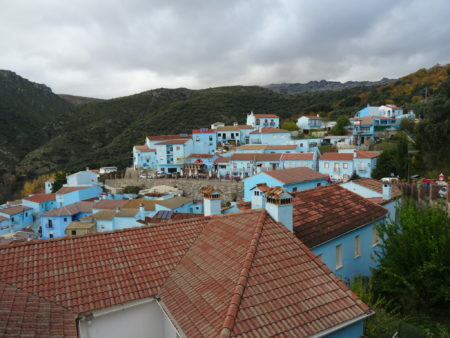 Júzcar is a small village that became first ever “smurf town” in the world, since June 2011. This creative idea was launched by Sony Pictures as part of the campaign to promote The Smurfs movie. The locals agreed to paint the traditional white village in bright blue. This was intended to be a temporary project, but the idea caught on so well that Júzcar started to organize a series of events and trade fairs related to the smurfs’ theme. The village is quite small but it has many different attractions, mainly for kids. 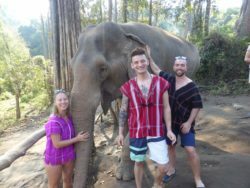 There are three types of routes that you can participate in – Adventure routes, Graffiti routes and Hiking routes. Some of the routes have also tasks that you should accomplish. Anyway, we were walking around and then we decided to have a coffee there. I have to say that it was suprisingly cheap! There are just two cafeterias near the sculpture of Papa Smurf – and that’s where I had to take a photo! We didn’t stay in Júzcar for a long time. After having a coffee, we headed to Málaga where we stayed overnight. 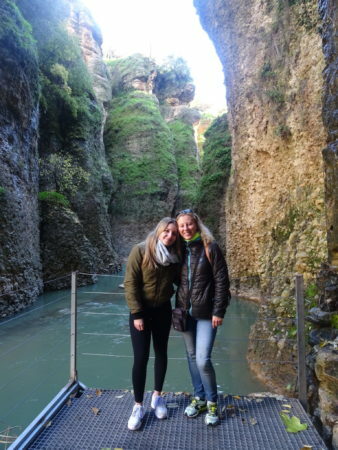 Nevertheless, visiting Ronda and Júzcar actually became an amazing one day trip. 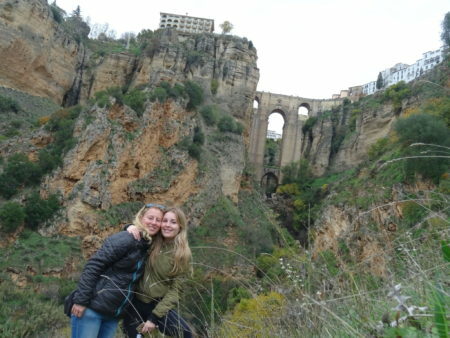 In Ronda we did a lot of sightseeing, we were discovering the town with excitement and we were amazed by its beauty. Júzcar was more like a chill out place for us even though I can imagine it being very busy when all the families with kids come to visit the village. 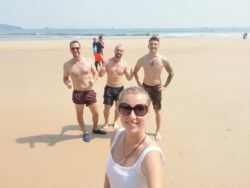 Obviously we chose the best time when nothing was overcrowded and like that we could enjoy our trip a lot. 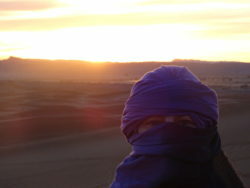 If you ever come to Andalusia, don’t miss these two places, they are worth visiting!